I've run across James' name in lists of the old 300, but in typical Orrick style, there is not much other information about him. I can't even find him in the census. So now my curiousity is in full gear. I'd bet a box of used pencil erasers that James traces back to the Maryland Orricks and therefore is connected to my Arrick family. 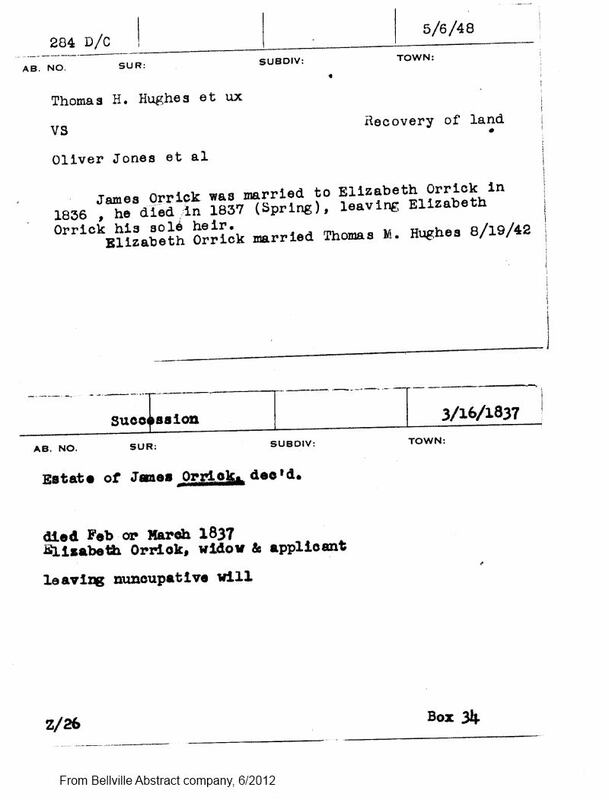 Who were James Orrick's Parents? What happened to James Orrick's wife after he died? A friend of mine Eddy is an oil and gas land man. He was able to find the Tobin Survey for Austin county. Right there is a block for James Orrick. #74. On the west side of the Brazos river not far from the county seat of Bellville. 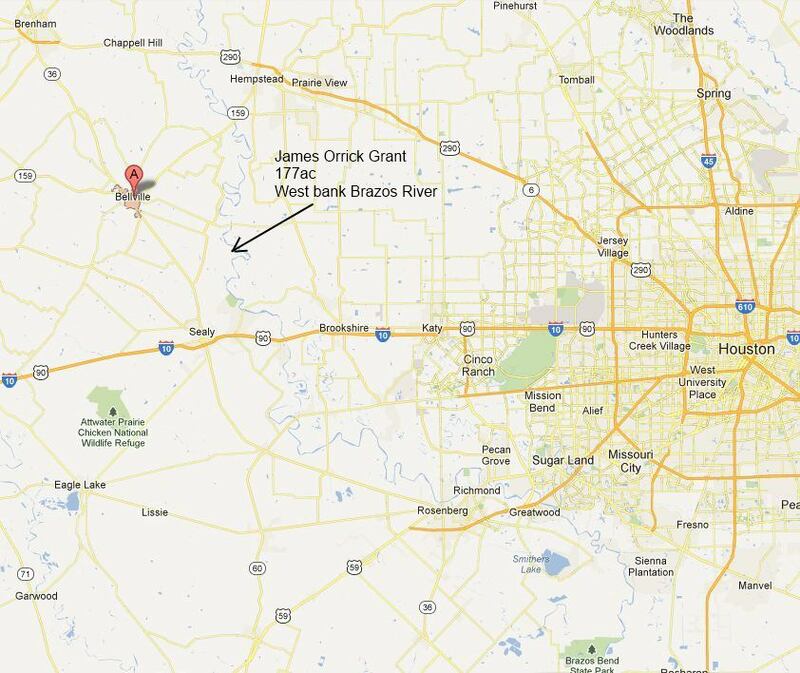 Map showing location of grant. West bank of Brazos river near Bellville TX, west of Houston. 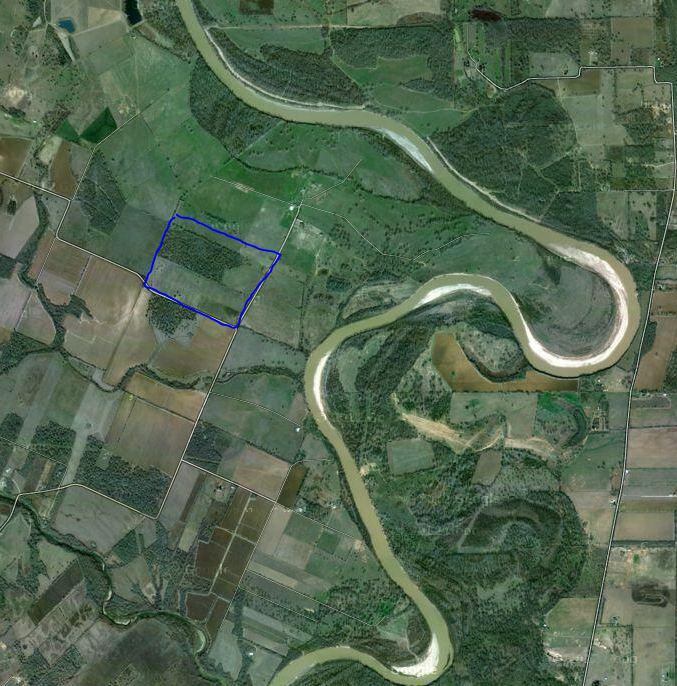 Here's the satellite image of the land (2012). West bank of Brazos river. Here's the original Grant to James Orrick. 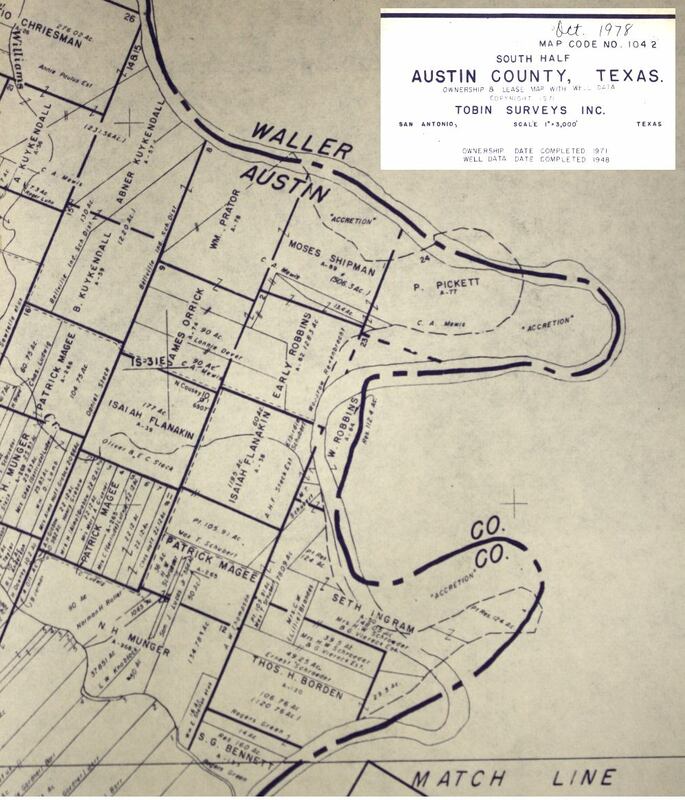 James received title to his 1 labor of land (177 acres) in Austin county on Aug 10, 1824. It's in Spanish and dated 1824. Signed by Stephen F. Austin. I always like to look at the signature. This one looks like his, not just an X. A random mention of James being a mail carrier in 1835 was found on the web. 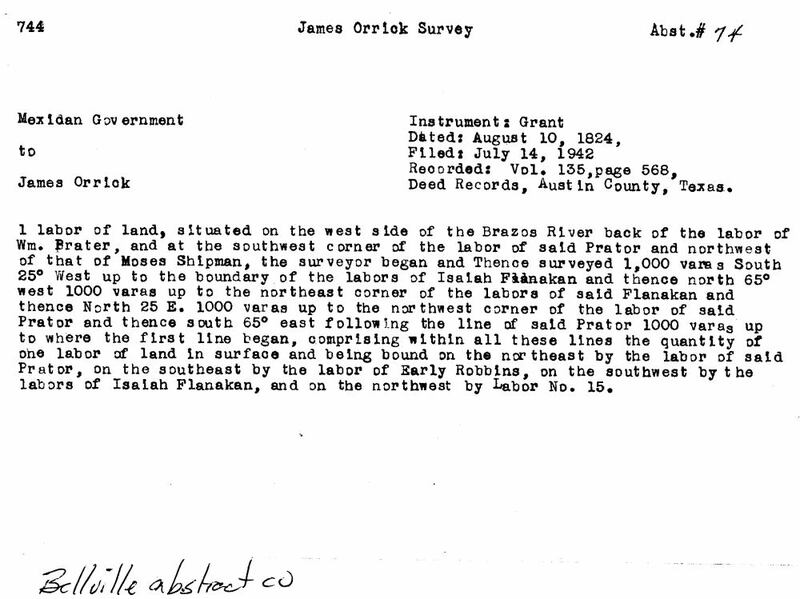 A very nice lady at the Bellville abstract company found a few documents for me about James Orrick's land. Elizabeth married Thomas H. Hughes. This issue of the Telegraph and Texas Register (Columbia, Tex. ), Vol. 1, No. 34, Ed. 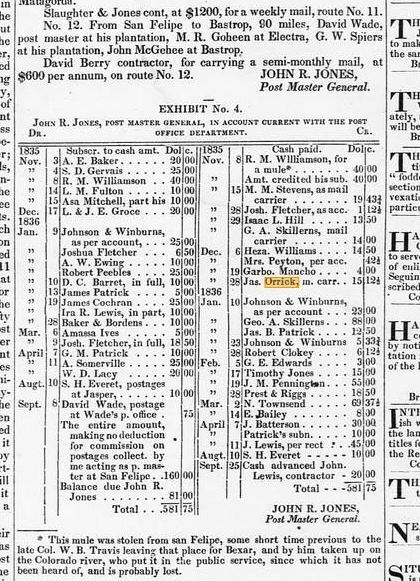 1, Tuesday, October 18, 1836 lists Jas Orrick as a Mail carrier. Something must be going on with the Orrick land. Fraud or something. This is WAY after James died. Who is Oliver Jones ? Who is this Oliver Jones who battled Thomas Hughes over the land? Well, he appears to be a pretty important fellow. Born in NY 1794, one of the 300, fought in the war of 1812, and played an important part in early TX government, including heading a committee to design the flag. 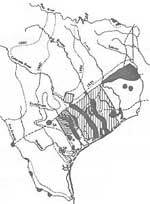 Oliver's land is a few labors southwest of Orrick's. Who is Thomas H. Hughes ? Thomas is harder to locate. Possibly his middle initial is really "M" and Thomas and Elizabeth may have had 2 kids: Elizabeth (1842) and Eliza (1841) in Washington Co TX. Still researching this to see where they ended up. 1860,1870 - can't find them. 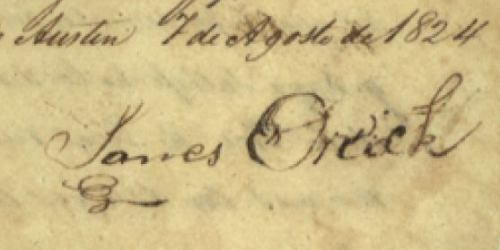 1840 Austin county tax list, shows Oliver Jones, but no Orrick or Hughes. The only Elizabeth is a Johnson. Who is John York ? County Sheriff of Austin County in 1837. Cousin Jeanie found this article in the Houston Telegraph 14 Apr 1838. All persons are forewared trading for, or having anything to do with. one league and one labor of land, certificate for which was issued by the land commissioners of Washington county, on the 6th day of January last, to the heirs of James Orrick, late of Austin county. 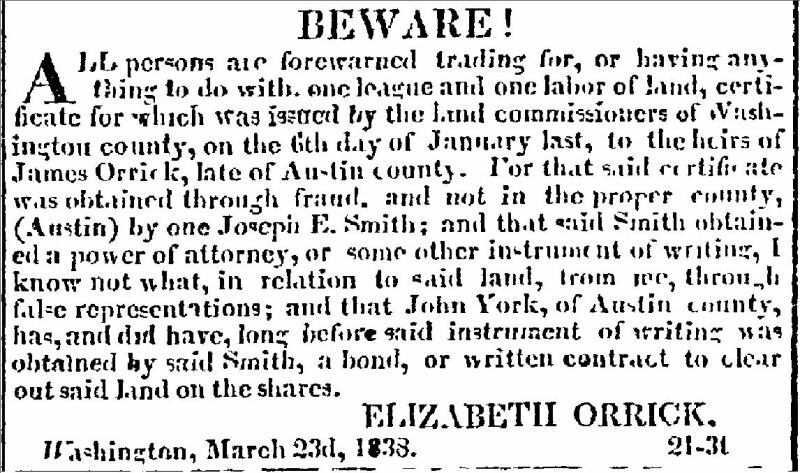 For that said certificate was obtained through fraud, and not in the proper county, (Austin) by one Joseph E. Smith; and that said Smith obtained a power of attorney, or some other instrument of writing, I know not what, in relation to said land, from me, through false representations; and that John York, of Austin county, has, and did have, long before said instrument of writing was obtained by said Smith, a bond, or written contract to clear out said land on the shares. I sense a road trip!